Even if you just have a minute or two. These are the tools that can help you prepare for this exam. Technology plays a significant role in our lives, and it’s only going to get larger. That’s why the ability to teach technology continues to grow in importance. In Texas, educators who want to teach technology to students in grades 6 through 12 take the TExES Technology Education 6-12 (171) exam. These educators have the training to teach various topics including computer software applications, manufacturing properties, and emerging technology. This guide provides an overview of the exam. You’ll also find a recommendation on excellent study materials that can help you prepare for this challenging test. How many questions are on the TExES Technology Education 6-12 (171) exam? The test, which is taken on a computer, contains 100 selected-response questions. 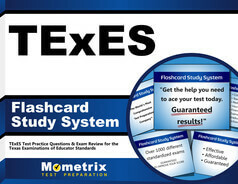 Prepare with our TExES Technology Education Certification Study Guide. Print or eBook. Guaranteed to raise your score. Get started today! How long can I expect to be at the test center? Candidates should expect to be at the test center for about 5 hours. Candidates have 4 hours and 45 minutes to complete the exam and another 15 minutes for test preparation. The test fee is $116, but there may be additional fees. 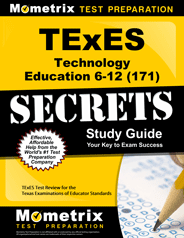 What’s on the TExES Technology Education 6-12 (171) exam? The exam has six domains, or content areas, as described below. Fundamentals of Technology Education includes technology’s characteristics like products and limitations; the technology design process; how to use and maintain technology systems including the role of emerging technology in technology’s evolution. Communication covers technical drawings; graphic design, including principals and applications; video and audio production equipment; desktop publishing including word processing and layout; technical drawing software; and photographic techniques, including photo manipulation. Manufacturing includes marketing plan preparation; product development including design and testing; manufacturing tools and equipment; manufacturing properties, such as elasticity and corrosion resistance; and manufacturing processes like casting, molding, and separating. Construction covers construction project types, like commercial and residential; engineering terms and concepts; construction tools and equipment, like drills, saws and levels; raw materials like wood, steel, and concrete; and farming and roofing techniques. Energy, Power, and Transportation includes energy and power concept and principals; renewable and nonrenewable energy; power systems, like thermal, electrical, and mechanical; electric components including inductors and transistors; and space transportation systems. Biotechnology and Computer Technology includes biotechnology ethical and legal considerations; computer hardware types like servers and routers; and software applications in graphic design and multimedia. What is the exam’s minimum passing score? Candidates must achieve a score of at least 240 to pass the exam. Candidates should receive their scores within five days of taking their exam. How can I access my test scores? Test scores are available through a candidate’s test account. Is it easy for me to find a date and time to take the TExES Technology Education 6-12 (171) exam? It should be. The exam is available all year-round, except for certain holidays. Candidates take the exam at a private company that has locations throughout Texas and the United States. You can check online for the location nearest to you. Yes, and you’ll need to bring two forms of ID. You must bring a piece of government-issued ID like a driver’s license or passport. You’ll also need to show a second piece of ID with your name and photo or a name and signature. Yes. You’ll want to arrive early because any candidate more than 15 minutes late might not be able to take the test. Can I bring personal items, like my mobile phone, into the test room? No. The test rules state that personal items such as mobile phones, electronic devices, and some items of clothing are banned from the test room. Please consult the full list of prohibited items, which can be found in the test materials. I need excellent materials that will help me prepare for the TExES Technology Education 6-12 (171). The study materials from Mometrix are the ones you need. These materials are written by education professionals who understand what other teachers need in test preparation. Our study guide offers tips that help candidates find the clues that give away the wrong or right answers and provides a study plan. Our flashcards are a fantastic tool that allows you to study on the go. Take the flashcards with you and study anywhere.